Researchers develop the first fully-implantable micropacemaker designed for fetal use. A team of investigators at Children’s Hospital Los Angeles and the University of Southern California have developed the first fully implantable micropacemaker designed for use in a fetus with complete heart block. The team has done preclinical testing and optimization as reported in the journal Heart Rhythm. 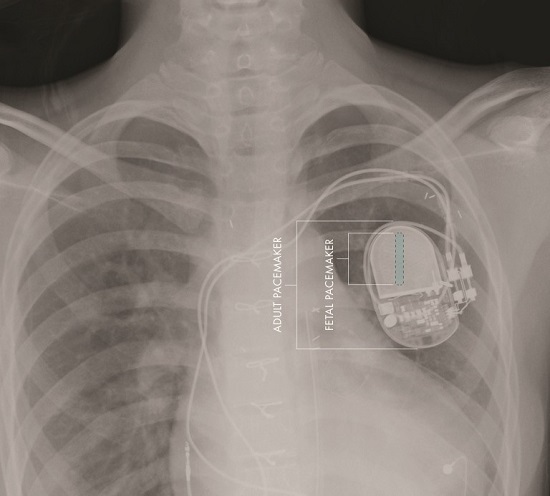 The micropacemaker has been designated a Humanitarian Use Device by the US Food & Drug Administration (FDA). The investigators anticipate the first human use of the device in the near future. The team state that up until now, the pacemaker devices that have been used in an attempt to treat this condition in a fetus were designed for adults with the medical community lacking an effective treatment option for fetuses. With each beat of a healthy heart, an electrical signal moves from the upper to the lower chambers of the heart. As this signal moves, it results in the heart contracting and pumping blood, explain the team. Congenital heart block is a defect of the heart’s electrical system that originates in the developing fetus, greatly slowing the rate of the heart and impacting its ability to pump blood. Although the condition can be diagnosed in utero, all attempts to treat the condition with a standard pacemaker have failed. Now, the current study has developed a pacemaker that can be implanted in utero, potentially without harm to the fetus or the mother. This novel device provides a real opportunity to prevent miscarriage and premature birth in babies affected with these abnormalities state the researchers. The size of the adult device requires a small part to be implanted in the fetus and the rest to remain externalized. This design has uniformly failed, likely due to fetal movement causing the electrodes to become dislodged from the heart. The team built on their experience of using microfabrication techniques to create biomedical devices, they have developed a micropacemaker small enough to reside entirely within the fetus. This will allow the fetus to move freely without risk of dislodging the electrodes. The researchers are now actively planning human trials of the micropacemaker device. Each year, approximately 500 pregnancies in the U. S. are affected by fetal heart block and could be candidates for receiving this device. Comparative sizes of fetal and adult pacemakers. Credit: Image courtesy of Children’s Hospital Los Angeles Saban Research Institute.